Dr. Hsu attended the University of Washington for her undergraduate degree in Psychology. After working for a year as a residential treatment counselor and in a genetics lab, she attended the Pacific Graduate School of Psychology at Palo Alto University to obtain her PhD in Clinical Psychology with emphases in Child & Family and Health Psychology. 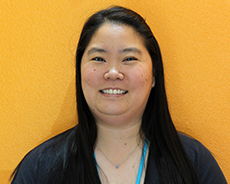 Dr. Hsu’s passion for working with children and families with Autism Spectrum Disorder and developmental disabilities started during a practicum at Children’s Hospital Oakland at the Children’s Hospital Autism Intervention (CHAI). She completed her postdoctoral residency at the Kaiser Permanente Autism Spectrum Disorder Center in San Jose. She worked there for four years in diagnoses, research, supervision, and training. Dr. Hsu currently continues to work part-time at the Kaiser Permanente Division of Research with the Autism Research Project as the clinical lead for two research studies, SEED (Study to Explore Early Development) and EARLI (Early Autism Risk Longitudinal Investigation).